I grew up on the East Coast. It was too hot in the summer to really grow great fuchsia, but that doesn’t mean that my father didn’t try with some modicum of success. So by the time I came to Alaska, I was at least familiar with these wonderful perennial plants. Familiar in this instance means I knew what the flowers looked like, and to me, that meant a white cup in the center surrounded by red petals. 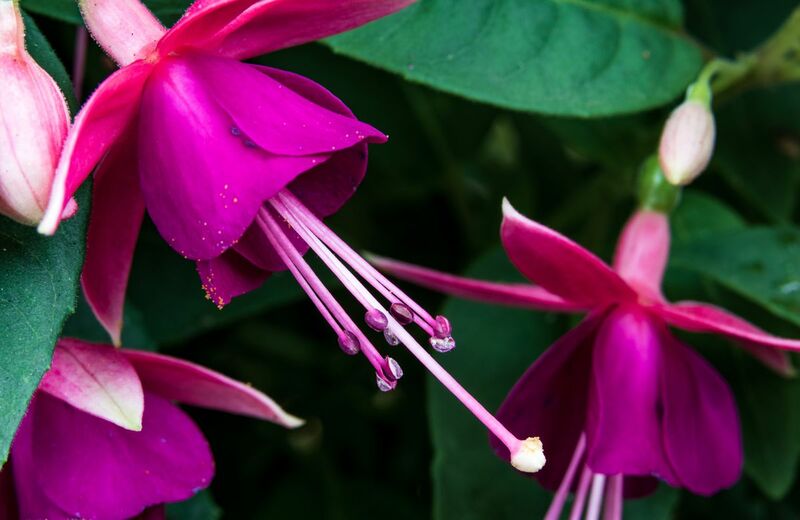 I soon learned a lot more about fuchsia, as they are one of the four horsemen plants of the Alaska Hanging Basket (along with tuberous begonias, pelargoniums and lobelia). For starters, I learned that that cup structure is called a corolla and they don’t just come in white. My dad was color-blind and avoided varieties with the red and purple corolla, of which there are many variations, which alone would make these very collectible. Those red petals turn out to be called sepals, the base of which is a tube that is attached to an ovary that fills with seed. The entire flower assemblage is attached to the plant by a stem called a pedicel. All of these parts can be different colors and hues. And, upon closer examination, there are pistil and stamens, which also have their own colors, depending on varieties. They, too, add to the color scheme of the flower, depending on variety, and there are more than 100 species and many cultivars, literally thousands of the types with which we are all familiar. 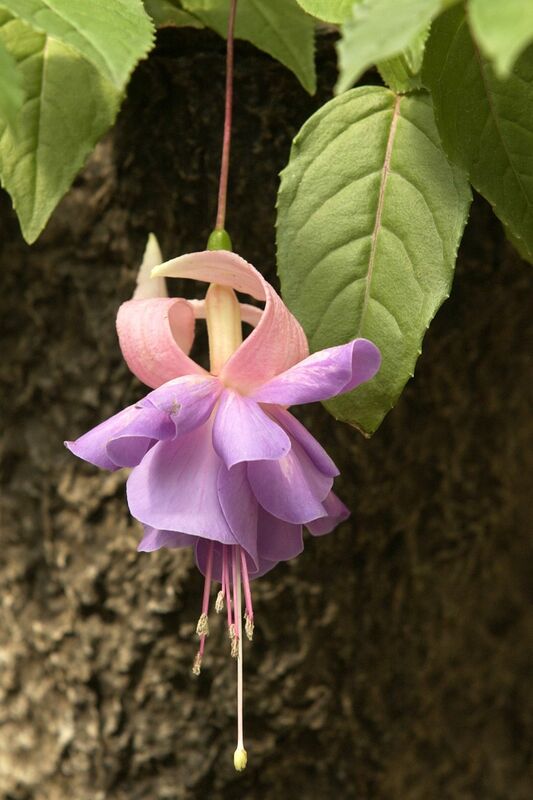 Fuchsias are a collector’s dream plant (assuming you are not too colorblind). The red and white colors are now just as likely to be purple, almost black, even green. They come in all manner of sizes, in both trailing habit and upright habit. Size refers not only to the plant size, but the flowers as well. There are diminutive, ¼- to ½-inch flowers along with the traditional 1- and 2-inch blossoms that are featured in most Alaska baskets. Best of all, these are plants that do better in Alaska’s cool climes than they do anywhere else I can think of. They excel here, which is why they are one of the basket horsemen. And, since many Alaskans over-winter fuchsia plants, there are lots of different varieties to collect. Plants are easy to root and easy to grow; what else do you need for proof other than the fact that this is a plant that does’t mind being watered with a hose end sprayer? They are rugged and beautiful. 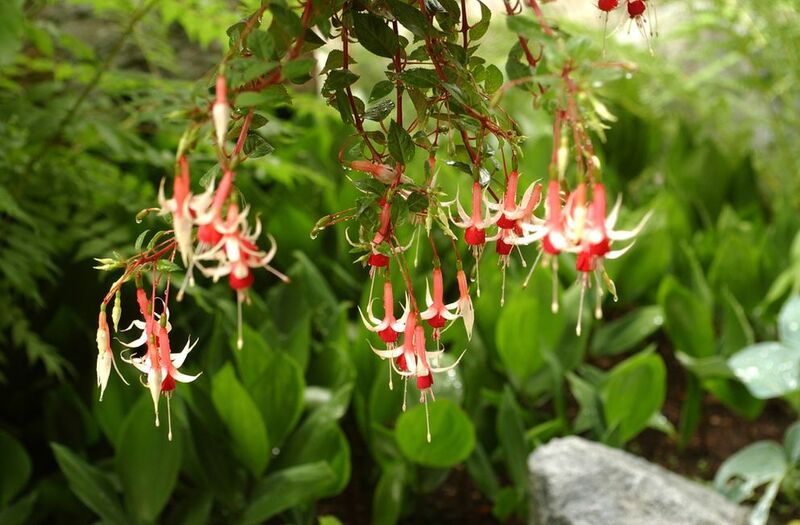 Now is when you should take out over-wintering fuchsia, water them and get them growing. You really should do this under lights. You can pinch back new growth to get branching. You should also start to see fuchsia starts appearing at local nurseries. These are being groomed for baskets, but you can buy them while small (and cheap) and grow them yourself. Better yet, you can train yours to become a tree or a “standard.” You will notice that there are lots of different kinds. Here is a plant that you’ll want to keep labeled so you can take and give cuttings and know what you have. I shied away from fuchsia for a while. I think this year it is time to go back. They are easy to grow and simply stunning. Nurseries: Start looking for stuff at your faves. They are all getting seed racks. Vegetable seeds to start: Artichokes (also grown as flowers), celery, leeks and onions.